Butler's Connor Bachman makes his way down the field against Knoch Thursday. Bachman scored four goals in the Golden Tornado's 13-4 victory. BUTLER TWP — The next man up did not disappoint for Butler's boys lacrosse team. With Knoch placing a high priority on the Golden Tornado's top goal scorer, senior Connor Bachman, Anthony Daviduk responded with a big first half. The junior midfielder scored four goals — including the first three of the game — in sparking Butler to a 13-4 win Thursday night at Art Bernardi Stadium. Butler's first six shots of the game were either off the mark or stopped by Knoch goalie Nick Koeller. Daviduk broke a scoreless tie with his first goal with 3:26 left in the first quarter. He scored again just 35 seconds later. Another tally from Daviduk, followed by Bachman's first score, pushed Butler's lead to 4-0 before the Knights got on the board with Jim Johnston's gaol with just over two minutes remaining in the first half. But the Knights, who were never able to sustain momentum in the game, trailed 6-2 at halftime. That came in the third quarter. 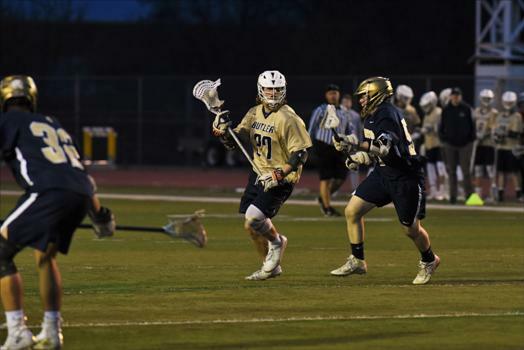 After Daviduk's success in the first half, Knoch loosened its grip on Bachman and he scored two of Butler's four goals in a 90-second span that put the Tornado ahead 10-3. “We brought everyone together and made some adjustments, both mentally and physically,” said Monteleone. The Knights (2-2) finished the game with 24 shots, but most of them did not come easily. “Butler's got a good defense and a lot of our shots were contested,” Barthlow said. Johnston scored three of Knoch's four goals, Matt Goodlin the other. Koeller made 10 saves for Knoch. Butler's Jake Cuny denied the Knights seven times. Bachman joined Daviduk in scoring four goals. Posting one goal apiece for Butler were Nolan Allison, Brody Allison, Matt Barber, Brody Lineman and A.J. Pellegrino. The win improves Butler's record to 4-3. The Tornado hope to remain above .500 with Friday's home game against Cathedral Prep.